You spend time with someone you are attracted to or like which could include the intention of getting to know them, to give or get something from them, and to determine if or how long you will continue doing so. Whether you do it in hopes of a relationship, a commitment, tangible other exchanges, or to avoid being bored and lonely. Do you want love or companionship? If yes, then age has nothing to do with dating unless you plan on living the rest of your life as a loner or believe you are too old for love. I have seen people meet and marry late in life or find the right companionship. But you have to be honest with yourself about your readiness to date. Loneliness can play Jedi mind tricks on you and make you think you’re ready when you’re not. When I refer to being ready, I mean are you emotionally healthy enough. If you’re not, you are vulnerable to attracting what you don’t want. After being hurt, it’s natural to be guarded, lack confidence or trust in others. This needs to be worked on. Only you can fix how you feel about yourself. However, you must not make somebody’s issues about you. I see this way too often, and it creates a form of false responsibility for what doesn’t belong to you. Own what’s yours (good or bad), work on it and hold those other folks responsible for theirs even if they seem to be in denial about it. Be honest with yourself about your emotional limits and take the time to provide the self-care required. You don’t have to be lonely in the process of your healing. You can still be active and engage with others doing what you love while enjoying life in the interim. Your dealbreakers are the things that are unacceptable and work against your emotional health and wellbeing. That’s my definition of it anyway. Feel free to add to it. Ignoring these will end up with your needs not being met. For example, a dealbreaker would be a person who demonstrates narcissistic behavior, is abusive and disrespectful. Although providing for your financial needs, they control, manipulate, and deprive your emotional needs. Sounds bad? Well, there’s much worse out there if you can believe it. Determining your dealbreakers helps you avoid these types of people. Prevention is critical, therefore you must follow through with reinforcing this boundary. To give more insight to avoid wasting time, read my post 5 Signs He or She Ain’t the One. If you are ready to mingle then be open, optimistic and ready to have fun. Set the intention to meet wonderful people, some who can become good friends, and for those who don’t wish them well until you cross paths with your beloved. Being open in this context is willingness … willingness to try something healthily new, to be bold and to challenge yourself in positive ways. Look for the upside, don’t expect the negative and for goodness sakes, make sure you enjoy yourself. Don’t agree to do things you know you may not like or enjoy just for a date or the company of another. If you decide to date older or younger, focus on the common ground you have with each other. Sometimes an old dog needs new tricks, and a young one is willing to learn. Relationships don’t have to be hard if you know what you want and go about it healthily. Don’t look for fault, believe me, you will find it. And guess what? Yours will show too! Learn to accept yourself AND others as is. Who wants to feel judged, right? Especially on every little damn thing. That’s enough to send anyone running! I see so many people wonder in amazement at the treatment they receive but fail to see how their behavior contributes to what they get. First impressions are lasting. Be yourself and if that’s not enough, then, “Thank U, Next” in the words of Ariana Grande. It ain’t that deep! Keep moving forward. Use a common sense approach to learning about whom you choose to spend your time. Find out as much as you can about them, ask the “right questions,” do your research, background checks, and vet suitors. Being blind to the dangers prevalent today can put your life at risk. Here’s one example of putting it into perspective, the Bravo hit show “Dirty John.” Listen, to be fair, there’s some “Dirty Janes” out there so use common sense and safe practices when allowing people in your life. Background checks can only do so much. A person may not have anything you can find on paper which is why you need to take your time and have your deal breakers in place. You know, our society has a history of painting the most sinister people as those who “look the part” when in many cases the opposites can and have been the real culprits (often covert). What seems obvious isn’t always obvious. Fact: Everybody has a past whether they are proud of it or not. While some people’s history is easy to be known and others have better resources at hiding theirs. Nowaways, even what’s deeply hidden surfaces faster which is why no one should judge (you’d think, right?). I digress … my point is that when it comes to discovering someone’s past whether they divulge it or you find out on your own, you get to decide whether it’s a dealbreaker or something you’re willing to ignore. Only you can determine what you can work with and you’ll have to live with your decision. Consider this, don’t overlook a person’s past if it’s still a current issue for you. No one is perfect, but someone can be just right for you and where you are at this stage of your life. If you’re on the fence about dating those with children, consider this before you opt-out. When it comes to a suitable potential relationship opportunity and what you can learn from it, I wouldn’t recommend you throw the baby out with the bathwater just yet. If there is real potential with someone, you need to observe how they manage their family responsibilities, their relationship with their children and the other parent. It will give you some excellent insight into how they might handle you and yours. With Ex’s, some situations get really petty out of anger, greed, hurt, jealousy, etc. While some people won’t do right no matter what the law says, so pay attention to what you see. It speaks volumes about a man or woman who handles their responsibilities and tries to foster a healthy relationship with their children regardless of the other parent. Keep it into perspective and remember actions speak louder than blame. There are many schools of thought on when and how to do this. Each person’s lifestyle and belief will ultimately determine how they end up carrying this out. Nonetheless, I will share my perspective and suggestions that I consider a common sense approach. I don’t recommend bringing any man or woman around children (that’s under 18) UNTIL you have established a healthy relationship dynamic, know this person, know their history well, know they are of sound mind and feel there is true potential with them being around for a while. Some may not agree with me on this and that’s OK. Children are vulnerable which is why a parent should take the utmost care in protecting them on all levels. I’m referring to when people start dating and immediately create this “family dynamic” without knowing enough about the people which they are involved nor whether the relationship has the potential to last. Kids remember what you didn’t do faster than what you did. So how long should you wait? As long as it takes to thoroughly know enough about them, their past and see how they show up in that established relationship with you. You can only be what you’re not for so long. Eventually, the true nature of a person shows up. Unfortunately, desperation and fear cause many to settle for that instant emotional fix or desire to be in a relationship so bad, they don’t do their due diligence with getting to know the person. Later, they regret it or worse, repeat the cycle with someone new and wrong for them. Hopefully, you’ll do what’s necessary and vet properly before introducing anyone to your family and children. If you take your time and do it right, you’ll find the right person. If not, you will have saved yourself and children some grief. Are We or Aren’t We A Couple? So what about that date that keeps leading to what looks like coupledom? You’re at a stage where you don’t want to waste time, you’ve found someone nice, and you’re enjoying each other. You function like a couple and have all the bells and whistles of what looks like a couple. You even travel together, spend time at each other’s home and met each other’s family and friends. Hell, you also have a toothbrush at their place. But there’s only one concern; you don’t know where you stand or if you’re in a commitment with each other. 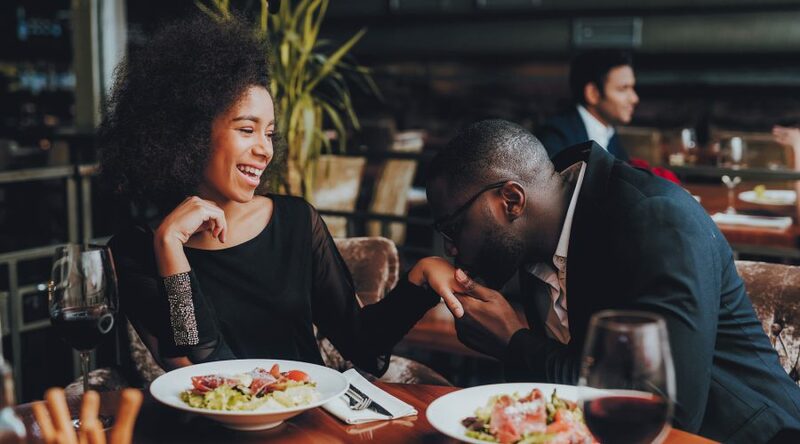 Consistent dating, good rapport, and connection with a prospect can mislead one to think that they’re in a bonafide commitment of sorts. Dating is not a commitment. A commitment to each other is an agreed declaration with supportive action and behavior between two people regarding their relationship and its status. No matter the age, this adult conversation about your relationship status needs to be discussed IF you want a committed relationship. If not, enjoy it for what it is or until you find what you are looking for. If you are tired of going through the process of discovering whether someone is healthy, viable and ideal for you, then you may need to take a break from dating or wait until you are emotionally ready and it shouldn’t be rushed. Dating is an opportunity to get to know someone, a method to determine if that person is a good fit amongst other things. Rushing is unwise. You must always take into consideration your emotions during this explorative process. Enjoyed this post? Click Here to Subscribe to My Blog .